Northern Ireland is a friendly and sociable country with a lot to offer. In fact, in recent years the Office of National Statistics rated Northern Ireland as the happiest place to live in the UK! 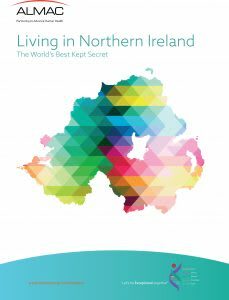 Download Almac’s Living In Northern Ireland brochure to find out more information. That’s down to many factors including the beautiful scenery, low cost of living and great employment opportunities as well as our optimistic view on life, all of which make it a fantastic place to live. There is an abundance of public parks, as well as countless beaches and forests. Northern Ireland’s capital city is currently thriving in an era of tremendous regeneration with an abundance of award winning restaurants and bars across the city as well as tourist attractions including the recently constructed Titanic Belfast Center, located within the up and coming Titanic Quarter area. Within a short drive from Belfast you are nearby to any number of attractions, from the legendary Giant’s Causeway to the scenic Lakelands of Fermanagh, the Walls of Derry, the stunningly beautiful Mountains of Mourne, the golden beaches of the North Coast and the green Glens of Antrim. Explore the great outdoors and you will find dramatic coastlines, castles, mountains, lakes, some of the best golf courses in the world, superb fishing, water sports, walking trails, scenic drives and historical landmarks. Northern Ireland is blessed with so many beautiful regions that you’re spoilt for choice when it comes to finding things to marvel at. There are a number of activities across the country for your family days out. Northern Ireland’s top museums take you to the fascinating past of our culturally rich country. Northern Ireland is home to two stunning, world famous golf courses at Royal Portrush and Royal County Down. Belfast is one of Europe’s most friendly and fashionable regional capitals, described by Lonely Planet as a ‘must-see visitor destination’. Whether on land or water or even in the air, Northern Ireland has a whole host of activities to cater to your more adventurous side. Northern Ireland is home to some of the most spectacular beaches in Europe providing long stretches of golden sand and impressive sand dunes. The Mournes is an area of outstanding natural beauty and has been proposed as the first national park in Northern Ireland. Giant’s Causeway is the number 1 Irish attraction in list of world’s top tourist spots. Northern Ireland wouldn’t be the same without its colorful combination of characters. For such a small country we have a lot of famous people who have made an impact all across the world. To name but a few we have on the big screen a big presence led by Liam Neeson, Jamie Dornan, Kenneth Branagh, Stephen Rea, James Nesbitt, Roma Downey and Sam Neill, also playwrights Martin Lynch and Marie Jones. Sport is important in the lives of many Northern Irish people with many Irish sportsmen and women enjoying international stature – including football legends George Best, Harry Gregg, Pat Jennings and Martin O’Neill, golfing champions Rory McIlroy, Graeme McDowell and Darren Clark, Formula One driver Eddie Irvine, snooker world champions Alex Higgins and Dennis Taylor and Olympic gold medalist Mary Peters. Northern Ireland has produced a wealth of world renowned writers, among them Nobel Laureate Seamus Heaney, C.S Lewis, Oscar Wilde and Samuel Beckett, playwright Brian Friel and screenwriter Brian Moore. In recent years Northern Ireland’s film industry has enjoyed tremendous success as the base for a host of large-scale productions including HBO’s Game of Thrones, Dracula Untold and the BBC drama series ‘The Fall.’ Northern Ireland is now regarded as a “sleeping giant” for film production says HBO executive Jay Roewe, due in part to it’s scenic rural locations and highly skilled talent pool. Northern Ireland has given the world a wealth of musical talent having produced such greats as Van Morrison, Gary Moore, James Galway, Phil Coulter, Brian Kennedy, The Undertones, Ash, Stiff Little Fingers and Snow Patrol.